Batman Unlimited Animal Instincts Clip: Nightwing Vs Cheetah! Batman Unlimited: Animal Instincts is an all-new animated adventure that follows the Caped Crusader and some of his crime-fighting colleagues. It arrives Tuesday, May 12 on Blu-ray Combo Pack, DVD and Digital HD. 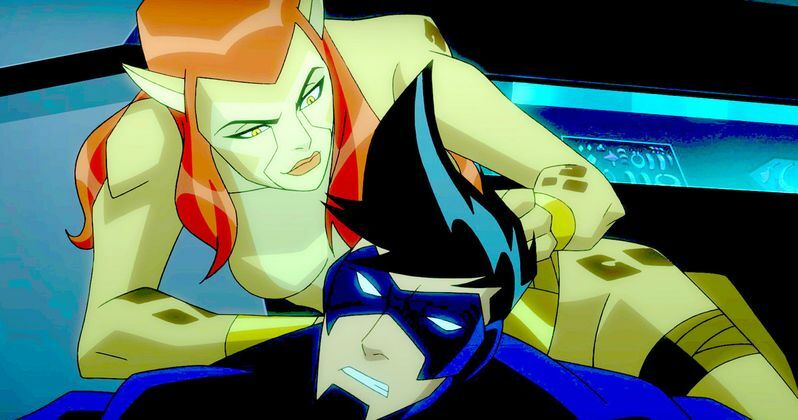 To celebrate, Warner Home Video has released an exciting clip, which features Nightwing (voiced by Will Friedle) squaring off against Cheetah (voiced by Laura Bailey). We also have a set of 7 new images. Another storm is brewing in Gotham and it's not only raining cats and dogs but evil Cyber Animals! When the city is plagued by a slew of bizarre crimes committed by an animal-inspired villain squad known as the Animilitia, comprised of Silverback, Cheetah, Killer Croc and Man-Bat, Batman must swing into action to investigate. These animalistic villains bring new and exciting challenges for the hero of Gotham, and Batman must find a way to bring these criminal creatures to a halt! But could the Animilitia be working for powerful businessman Oswald Cobblepot a.k.a. The Penguin? How does The Penguin's new invention of robotic Cyber Animals fit into the mix? In the end, it'll the combined forces of Batman, Flash, Green Arrow, Nightwing and Red Robin to combat these Animal Instincts. Check out this exciting sneak pek, as Nightwing and Cheetah flirt before throwing punches in each others direction. Then be sure to check out Batman Unlimited: Animal Instincts when it arrives tomorrow!